My hand-blended incense is created to enhance your connection with the spirits, deities and ancestors. It will enhance meditation, tracework or divination. Perfect for scrying! 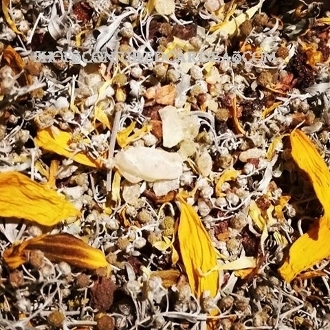 Created from marigold petals, sunflower petals, wormwood flowers, Mexican copal, red myrrh and more. You will receive over an ounce of herbal incense. Comes with two charcoal briquettes to get you going!